So I had a craving for Spanish rice (and ended up forgetting the banana peppers so BOO). I decided to use up the pancetta I had left in the fridge so I cut that into little chunks and rendered the fat from them. I removed the pancetta from the pan and set it aside. I added some olive oil to coat the bottom of the pan and sauteed a sweet onion till it was translucent. To the hot oil and onion I added the dry rice and mixed that around till it started to turn a light golden brown. I added the chili and cumin to the pot. I put the chicken stock in and the diced tomatoes then added the tomato paste. Then I added a bit of salt and a generous amount of pepper. I covered the pot and set the eye on low. When the rice was almost done I added more stock as it had all absorbed. For the shrimp I simply melted some butter in a pan and added a lot of jerk seasoning and some salt. 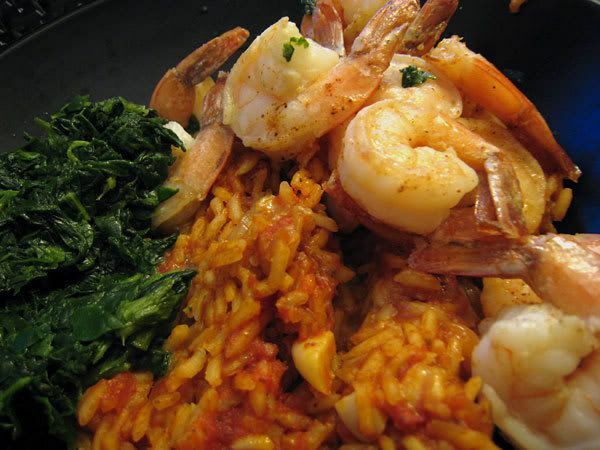 In "jerk", "recipes", "shrimp", "spanish rice", "spinach"